CHICAGO, IL, 4/22/15 – THE MISSION is pleased to present Points in Space, an exhibition of recent sculptures by Susan Giles. Giles’ process explores representations of lived experiences in relation to the built environment. She reflects on the symbolic power of verticality and aerial perspective in contrast to the vernacular aesthetic of phone cameras, Google Street View and social media. Giles selects and isolates fragments of iconic architecture in the same way that tourists’ photographs privilege the most distinctive and recognizable elements of a place. An opening reception will be held on Friday, May 8 from 6 to 8pm. The show continues through Saturday, June 27, 2015. 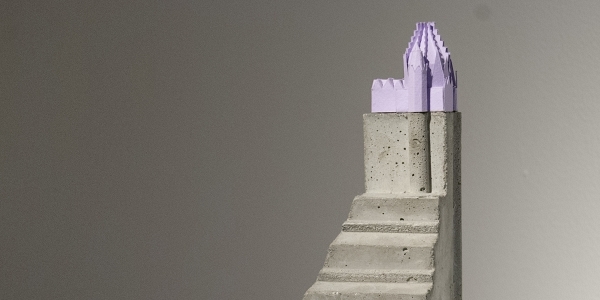 Points in Space features small-scale sculptures that combine intricate paper models of iconic architecture -– assembled from found and original patterns –- with raw concrete bases resembling everyday infrastructure such as viaducts, columns and bridge supports. The exhibition also showcases a larger scale sculpture of two towers in Prague: the Zizkov Television Tower and the steeple from the Church of Saint Procopius, formerly the tallest tower in Prague. Constructed of concrete, paper and a wooden scaffold-like support, the two structures are presented at equal heights. Giles’ formal comparison of the two structures conversely suggests opposing perspectives; the church continues to point toward the heavens, while the television tower returns our gaze to Earth. This desire to capture, manipulate, and own architecture is the driving force behind the scale of Susan Giles’s intricate sculptures. Her miniature buildings mimic the form of a souvenir, allowing a perceived ownership of the architectural forms tourists collect as objects of their travels. Giles gives a tangibility to these buildings formed out of drawing paper, allowing one to imagine they have been manipulated by their own hand, designed for their own home. The sculptures lay perched upon or skewed atop concrete— the materials a balance of potential ideas against the realities of a bleak quotidian material. The concrete reflects the grounding features of a city perpetually passed over by tourists, the viaducts and columns that lay far below the commonly photographed spires, minarets, and antennae that yearn to poke through the sky above. An exhibition brochure featuring an essay by Chicago-based writer and art journalist Kate Sierzputowski will accompany the show. Large-scale wooden sculptures by Susan Giles can be seen in a concurrent exhibition, Scenic Overlook, at Hyde Park Art Center through July 26, 2015.